Your garage door is one of the most used entry points of your home. If you are one of many homeowners that use as often as twice a day or more, making sure that it stays in the best possible condition is very important. Just like any large electro-mechanical device that gets used multiple times a day, making sure no hidden dangers are lurking is crucial. Door panels can weigh upwards of three hundred pounds, and should they collapse unexpectedly, they can cause severe bodily injury and property damage. Your system's springs are also capable of dishing out disastrous injuries, especially when they are neglected. To make sure they are in a good working order, routine inspection and lubrication are required. In order to make sure your garage door can't be exploited by burglars and intruders, it needs to stay in perfect shape. Any underlying damage, small as it may seem, could potentially be taken advantage of. Whether it's the opener unit that communicates with your remote via RF transmission and suffers from the occasional signal interference, or a simple matter of your door not closing all the way down, these types of breaches can compromise your home's security. The best way to make sure you are properly protected is to have your entire door system examined on a routine basis. 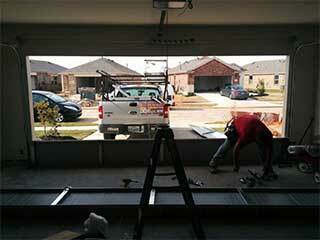 Routine maintenance is key when trying to ensure that your garage door lasts for as long as it possibly can. This procedure will prevent a lot of accidents from occurring and will make sure minor issues get nipped in the bud before they escalate into large-scale problems. This will not only make your door function properly for a long time, it will also make it more efficient. That means you'll save money on expensive repairs in the long run. Don't wait until it's too late. Call our experts at Garage Door Repair Henderson to schedule a maintenance appointment that will make sure your garage door's condition stays optimal for as long as it can.